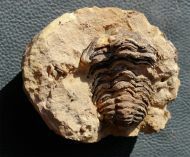 Here is a decorative trilobite concretion from Morocco with a fine Colpocoryphe inside. 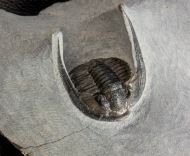 This trilobite likely belongs to the species Art Colpocoryphe rouaulti. 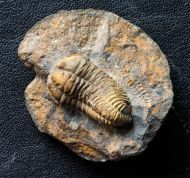 Here is a fantastic Morocco Trilobite of the the rare species Cyberella lemkei in a exquisite quality. Cyberella occurs in the higher level of the Jbel Issoumour on Taboumakhlouf section. 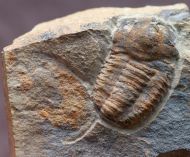 This is a Morocco Trilobite of the quite rare genus Cyphaspides from the Devonian of the locality Jorf. 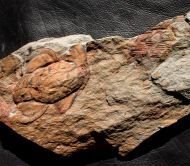 This is a morocco Trilobite of the genus Diademaproetus from the middile Devonian. 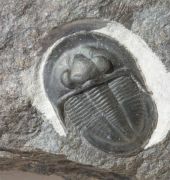 Here is a trilobite in a typical concretion of the species Flexicalymene ouzregui from the Ordovician of Morocco. Here is a first class Morocco Trilobite of the species Hollardops mesocristata with nice preserved eyes from Jbel Oufaten. 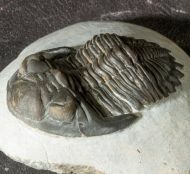 Here is a trilobite of the species Kingaspis sarhroensis from the middle Cambrian of Morocco. 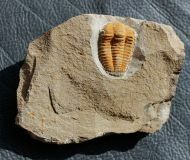 Here is a rare and interesting piece from the middle Cambrian of Morocco. This slap shows a Trilobite of the spcies Kingaspis and non trilobite Arthropod of the genus Forfexicaris. 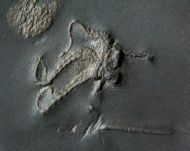 Here is a detailed Metacanthina issoumourensis from the „Couche Rouge“ of the Jbel Issoumour. 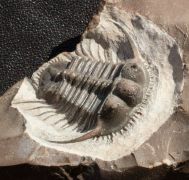 On this moroccan trilobite plate are servile quite large specimens of the species Ogyginus forteyi. 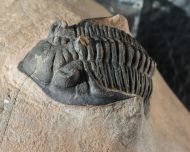 his is a large Praradoxides head together with a incomplete trilobite of the gemus Bailiella from the upper middle Cambrian of Morocco.